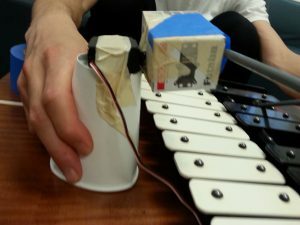 For this assignment, our team tried explore how to get motors to operate and manipulate musical instruments that we easily are able to play as humans. For this, we explored the claves, kalimba, egg shakers, bell kit, and tambourine. We first tried having servos operate the claves, but this proved to be too much of a challenge since we need to hold the claves at the point and allow them to resonate, which is something we do easily when we hold them with our hands, but not with a servo. We also looked into making noise on the kalimba using ear plugs on servos (which mimic human fingers), but the sliding motion with adjusting pressure was too difficult. We also tried using the egg shaker and a coffee cup full of beans using a DC motor or servo, but we found that the shaking beads just went towards the edge of the shaker container. We then explored different ways to get servo motors to hit mallets on a bell kit. We noticed that if we allow for a little bit of “give” to allow a bounce on the key, rather than directly hitting the key and dampening the sound, we got a better sound. 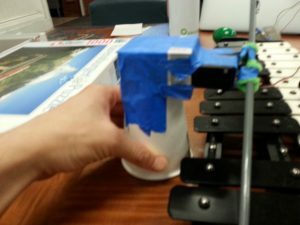 We made a “competitive game” out of the instrument: we attached two servos to the mallets and allow two player to operate pots to change the percussive nature of the mallets and instruments. We also explored using a DC motor on a tambourine. We found if we attached tape at different diameters, we can change the amount it hits the bells. We decided to change this with a potentiometer as well. We also decided to explore a visual medium on processing, where if you click and move the mouse – depending on how slow and fast you go, the visual component and the sound changes. In the end we decided on having servo motors (controlled by pots) hit the bell kit and kalimba, a DC motor (controlled by pot) operate the tambourine, and a processing script on a computer. Our 4 inputs are: 2 pots for the mallets, 1 pot for the tambourine, and 1 mouse for machine. We created a fun noise game where we all contribute a part to create a cacophony of sounds!